Not being much of a Charles Dickens fan, I would say these are neither the best of times nor the worst of times, but we may soon find ourselves close to one extreme or the other with the approaching deadline for transferring Antioch College to the Board Pro Tem. That does make these the most stressful of times for many of us in Nonstop, the College Revival Fund and the Alumni Board. 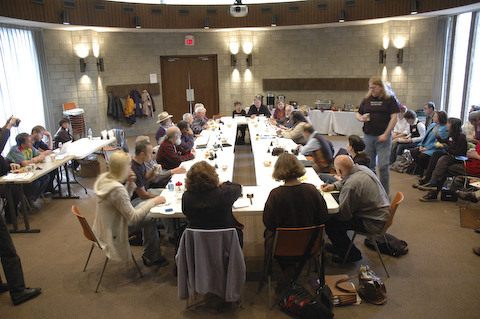 Collegiality, creativity and fortitude, especially now, are among our most treasured assets. Where there are no Antiochians, strive to be an Antiochian. The first Alumni Board meeting of the year opened morning of Friday the 6th with a presentation by Antioch Emeritus Professor Steve Schwerner, who was representing the delegation if educators who came to Nonstop and reported on their visit to the Board Pro Tempore. [link to Record article on visit] Schwerner said he expected that everyone had already read the eight-page report, [Link to the Report] and preferred to answer questions from the floor rather than reiterate the points made on paper. He specified that he would be unable to answer “questions of speculative nature,” since he was not in a position to answer them, and stipulated that he could only speak for himself. Matthew Derr then announced that the Task Force was making “significant progress in coming to an agreement with Antioch University;” “we are in a dance together… until we come to an agreement,” he said, “the dance seems to be speeding up and the parties seem to be getting along.” He expressed confidence about the eventual separation of the college from the University “in a way that we described in the alumni resolutions from Reunion and in the charge for the Board Pro Tem.” While the room erupted in laughter at Derr’s statement that “much of what we’re doing now is actually in the hands of attorneys, and that’s a very good sign,” he assured the board that GLCA “neutral” lawyers were involved and that all parties involved in the task force were working in the same direction. 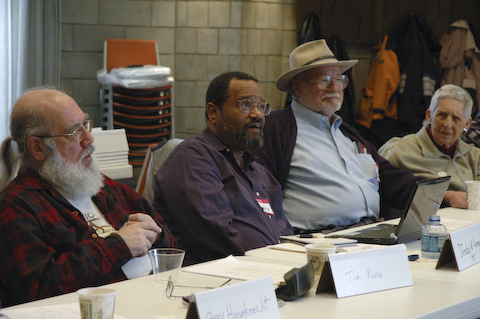 The Task Force will meet in Boston on Monday March 16th for a midpoint report, and a GLCA press release will follow. Derr dismissed the rumors according to which the date of the definitive agreement had been deferred. “It’s in everybody’s best interest to do this sooner rather than later,” he said. Despite the economic crisis, the fundraising target for the 90 days period are not unattainable, Matthew Derr affirmed. “We’re making progress, funds are coming in, big gifts seem to be coming in daily, people are taking our appointments, they’re not turning us down.” As to his fundraising strategy, Derr said: “My essential case statement is: now is the only time when one gets to support Antioch. It’s now. I personally give to planned parenthood, but it will be there next year.” He further explained that “by necessity,” the focus was on major giving ($25,000 and up,) but that a broader, Obama-style fundraising campaign was to be expected for the upcoming years. In regards to the college’s accreditation, “it is a very narrow band of work we’re doing,” said Derr, who emphasized that the task consisted of delineating a process for obtaining accreditation; “it’s process, not content,” he underlined. “It is our impression that there is a lot of goodwill and interest in facilitating this,” he assessed. 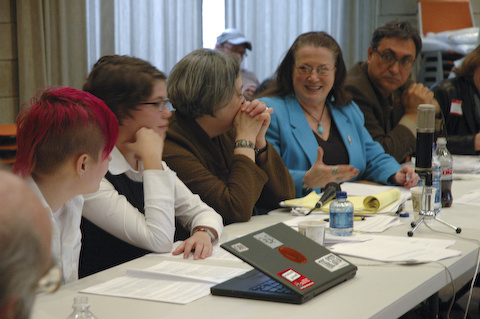 When several board members expressed concern about the fact that no Nonstop faculty member had been invited to join the Board Pro Tempore despite the alumni board’s recommendation, Matthew Derr answered that the bylaws included provisions for both a faculty member and a student to join the board. 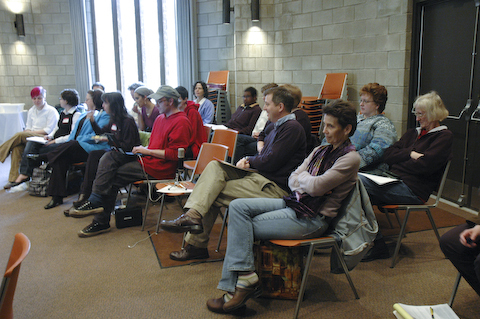 However, none of the Nonstop faculty is, as of now, officially a faculty member of the college: “there will be no employees of the future Antioch College until we have Antioch College,” he declared, “and the process by which we have employees hasn’t been defined.” Moreover, having a board member engaged in a lawsuit against the University would be problematic for the negotiations; the faculty lawsuit was thus cited as another reason for the current absence of faculty member on the board. 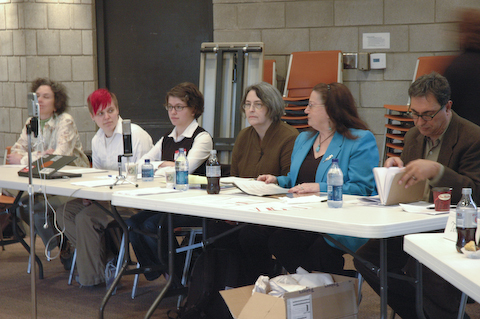 Nonstop presented Friday afternoon the “Nonstop Antioch Proposal to the Antioch College Alumni Board.” The proposal was written by a committee of ExCil, which included Beverly Rodgers, Hassan Rahmanian, and Chris Hill of ExCol, Community Manager Chelsea Martens, student Jeanne Kay, faculty Jean Gregorek, and staff Carole Braun. 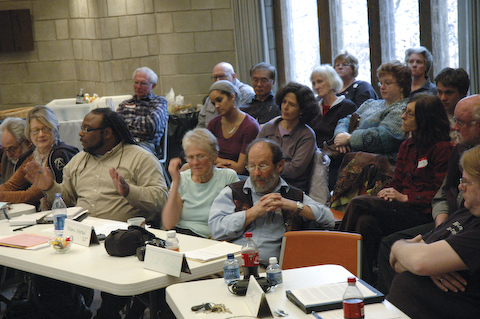 The proposal described how Nonstop could be integrated into the new independent Antioch College; students could be working in recruitment, fundraising and rehabilitation of the campus; staff working as staff and faculty taking on various administrative roles, writing grant proposals and mentoring students. “What we’re asking this weekend is for you to help us fine-tune this proposal. It will take all of us to be able to come up with a proposal that makes sense to the governing bodies, to the responsibilities that all these governing bodies have,” said Chris Hill. College Revival Fund (CRF) Treasurer Barrie Grenell said that the new bookkeeper was close to straightening up the budgeting mishap. “We had to go back and relook at all of the transactions that took place and make sure that we did have everything correctly, and we need to still do that with the pledges….but in terms of the cash part we feel confident that we’ve got that part down. Grenell announced that a CRF audit was upcoming that would focus on July 07 to December 31st ’08. Grenell went on to address the issue of Nonstop’s funding. The last benchmark to guarantee Nonstop’s funding through June had not been met yet, and after previsions of incoming funds in the next two months, it was estimated that between $50,000 and $60,000 were still to be raised to fulfill the deficit, but it was suggested that the working figure should be set at $75,000 because of the uncertainty over incoming revenue. Nonstop unrestricted funds coming every month were presented as one of the best ways to fulfill the gap; about 11,000 dollars have already been transferred from unrestricted funds to Nonstop, and any upcoming unrestricted funds not used for administrative overhead is set to go to Nonstop. Most outstanding pledges were said to have been made by Alumni Board members; Grenell said she had “some indication” that some of these pledges would not be fulfilled. Tim Eubanks ’00 suggested cutting spending in other areas in order to redirect money to Nonstop. Barrie Grenell asserted that Nonstop’s budget should not be micromanaged; and it was said that cuts in the CRF budget should be discussed in another venue. Budget Committee member Wayne Snively suggested that each board member commit to collecting $2,500 from fundraising or personal funds; Barrie Grenell specified that this would be an average, since each board member’s circumstances vary. 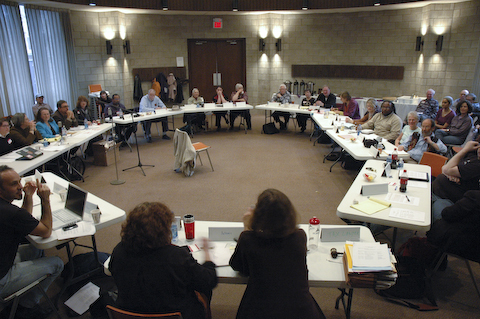 Several solutions were suggested to remedy the deficit through June, including sending Nonstop community members to chapter meetings, reducing the Nonstop budget–though some objected that Nonstop having come under budget and considering that a commitment had been made by the board to cover the approved budget– and board members individually fundraising among their friends and alumni from their area. “We are going to try our level best to make sure that we can fulfill our promises,” Nancy Crow concluded. Pledge forms were distributed during the meeting, Barrie Grenell announced that $7410 had been raised in cash, $10,700 had been raised in pledges, there was 350 dollars pledge payment and a possible $5000 withholding, for a total of between $18,000 and $23,000 raised in the hour.